Conducted on an annual basis, the J.D. Power Automotive Performance, Execution and Layout (APEAL) Study measures what people like what people do not like about their new vehicles. Once owners have had their new vehicles for at least 90 days, survey respondents tell J.D. Power how satisfied they are with the performance, design, layout, and features of their new cars, trucks, SUVs, and vans. Using this information, J.D. Power creates Power Circle Ratings to visually express a summary of the gathered data. Consumers can use these ratings during the new-vehicle selection process, helping them to understand which makes and models are liked most and which are liked least. This buyer’s guide highlights the top-rated 2018 Family SUVs from the J.D. Power 2018 APEAL Study. Each model listed in alphabetical order below receives a Power Circle Rating of 4 or 5 out of a possible 5 for overall appeal. Buick redesigned the popular Enclave for 2018. Among the largest vehicles in its segment, a 310-horsepower 3.6-liter V6 engine powers the 3-row SUV, driving the front or all four wheels through a 9-speed automatic transmission. Standard, Essence, Premium, and luxurious Avenir trim are available. The 2018 Buick Enclave receives an APEAL Power Circle Rating of 4 out of 5. Redesigned for 2018, and sharing its platform with the Buick Enclave, the Chevrolet Traverse is among the largest SUVs in its segment. Trim levels range from basic to plush, and most have a 310-horsepower, 3.6-liter V6 engine and a 9-speed automatic transmission powering the front or all four wheels. The Traverse RS, however, features a turbocharged 2.0-liter 4-cylinder engine whipping up 255 hp and a robust 295 lb.-ft. of torque. 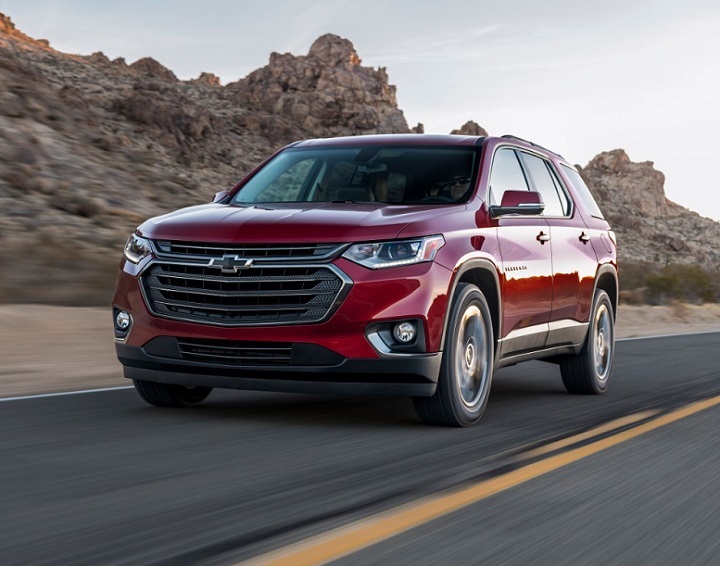 The 2018 Chevrolet Traverse receives an APEAL Power Circle Rating of 5 out of 5, and is the award recipient in the Midsize SUV segment. Completely redesigned, the 2018 Ford Expedition offers greater cargo capacity, towing capability, and passenger space than the sales leaders in its segment. Standard and extended-length (Expedition Max) versions are available, in XLT, Limited, and Platinum trim. They all get a twin-turbocharged 3.5-liter V6 engine making between 375 hp and 400 hp, depending on the trim level. The 2018 Ford Expedition receives an APEAL Power Circle Rating of 5 out of 5, and is the award recipient in the Large SUV segment. A stylish full-size SUV available in two different body lengths (the longer one is called XL), the GMC Yukon is a more upscale alternative to a Chevrolet Tahoe. Offered in SLE, SLT, and Denali trim levels, the Yukon and Yukon XL are fitted with one of two V8 engines. Within its competitive set, this GMC does not lead its segment in terms of cargo space, towing capacity, or passenger room, but that doesn’t seem to impact its popularity, or its appeal with owners. The 2018 GMC Yukon receives an APEAL Power Circle Rating of 4 out of 5. A midsize, 5-passenger crossover SUV with expressive styling and an upscale interior, the Nissan Murano is popular with owners. Five trims are available: S, SV, SL, Midnight Edition, and Platinum. They all have a 260-hp 3.5-liter V6 engine and a continuously variable transmission that powers the front or all four wheels. For 2018, all trims gained standard equipment. The 2018 Nissan Murano receives an APEAL Power Circle Rating of 4 out of 5. After sitting on the SUV sales boom sidelines for more than 20 years, Volkswagen finally joined the family-size fray with the new 2018 Atlas. Positively huge inside, and equipped with undeniably rugged styling, the Atlas comes with a turbocharged 4-cylinder or V6 engine, front-wheel or all-wheel drive, and in S, SE, SEL, and SEL Premium trim levels. A value-packed Launch Edition is also available. The 2018 Volkswagen Atlas receives an APEAL Power Circle Rating of 4 out of 5.